Turn ordinary grilled steak extraordinary with a simple caprese topping of tomatoes, mozzarella and fresh basil. Steak caprese will be a summer favorite! Last week I wrote about the method the Southern husband and I discovered recently for how to grill a perfect steak...seared and crunchy on the outside, tender and juicy on the inside, and while a steak cooked that way is absolutely wonderful all by itself, sometimes you want a little something-something to go on and around it. Things that I love on my steak include blue cheese butter, chimichurri sauce and good old A-1, but in the summertime, there’s nothing, and I mean nothing,that beats a steak that has been grilled, sliced and covered in fresh tomatoes and basil and chunks of creamy mozzarella cheese. In other words, steak caprese! Caprese salad is one of my all time favorite things to eat in this world – caprese means a salad comprised of tomatoes, basil, mozzarella and a little olive oil and salt and pepper. Caprese is usually made with large sliced tomatoes and sliced mozzarella, but for this steak version of the recipe I like cherry tomatoes and those little mozzarella balls that you can usually find in the supermarket in little round containers, although if you can’t find those, cubes of regular fresh mozzarella is A-OK. It’s a little easier to eat that way, and makes such a pretty presentation. Turn ordinary grilled steak extraordinary with a simple caprese topping of tomatoes, mozzarella and fresh basil. Steak caprese will be a summer favorite!Click to TweetThe other difference between caprese salad and this steak topping is that I like to saute the cherry tomatoes just a little bit so that they get a little tender, and that way they also match the nice warm temperature of the steak. The combo of the warm steak and the warm tomatoes are going to cause the cheese to get just light soft and melty in a completely heavenly sort of way. Sprinkle the basil leaves on at the very last minute, since you want them completely fresh. With this approach, you won’t even need a side dish to go with the steak, since your side dish is actually ON the steak, but I highly advise serving it with some crusty Italian bread to help mop up all the mixed up juices from the tomatoes and the steak and the cheese. Just. Plain. Heaven. So there you go…a summertime steak supper that you’ll still be remembering fondly when the snow flies. Grill the steak to your liking, 4 minutes per side for rare, 8 minutes per side for medium well. Let rest for 5 minutes under foil, then slice thinly. While steak is cooking, heat the oil in a skillet over medium high heat. Add tomatoes and saute until just softened, about 5 minutes. Arrange steak slices on a platter and scatter tomatoes, cheese and basil leaves over the top. Season with a little salt and fresh ground pepper and serve. I love anything Caprese as well. So far this week I’ve done Caprese BLT’s and Caprese Zucchini. Mmmmmm. One of my favorite summer steaks is a BLT steak. Mixed greens, thick sliced tomatoes, and bacon, on top of a perfectly cooked steak. Then everything gets a drizzle of a balsamic reduction. Oh man, that’s good stuff. Oh, my gosh. That sounds HEAVENLY! Oh yum. This looks delicious!!! Thanks Robyn – I think of it as summer steak! What a great way to freshen up steak! And such a fun new use of caprese salad. I just realized I haven’t made it yet this summer! Shame on my Italian soul! Yum! 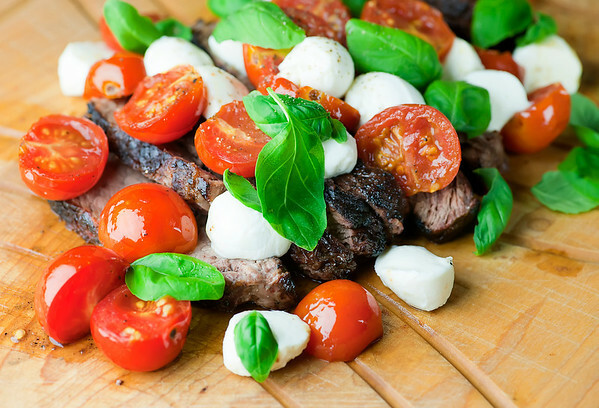 This looks delicious :) I love steak and caprese! Can’t wait to try this! Nothing like steak with tomatoes and cheese! Yes! Gotta use up the very last of those late summer tomatoes while we can!